As one of the most prolific writers of the 19th century, Fyodor Dostoevsky incorporates a number of complex symbols into his writing, each of which has the ability to represent a number of deep political, social, and religious issues. This is a topic suggestion on Symbolism in Crime and Punishment from Paper Masters. Use this topic or order a custom research paper, written exactly how you need it to be. The clearest symbol in the novel is that of the city of St. Petersburg. As Dostoevsky describes the city, it is dirty, crowded, and crime-ridden. The most inhumane of behaviors are on display for all to see, including rampant drunkenness, domestic violence, and extreme poverty. This chaos is symbolic of the mental state of the main character, Raskolnikov. As he is transitioning from a delirious state to one of confession and redemption, one can only hope the city itself will undergo a similar transformation. While history has taught us of the reformed nature of Russian society in this period of time, the reader of this novel is left waiting to see if the decay and disorder rights itself, as in the main character’s experiences. While the city of St. Petersburg is a large symbol that comes to represent a wide swatch of the story, there is an equally important symbol in a small item: the cross given to Raskolnikov before he goes to confession. As with any usage of this symbol, the cross is a reference to redemption, given by Jesus Christ for those who believed in him and taken advantage of by the main character of the novel when he reaches out for confession. The hope that he can redeem himself with a host of personal changes is something the reader can only imagine, just as the redemption of the city of St. Petersburg is something the reader can only hope for. 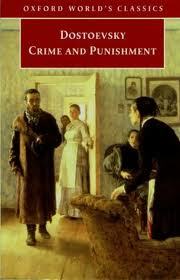 Themes in Crime and Punishment - Themes in Crime and Punishment research papers examine Dostoevsky's themes. Violent Crime - So it seems that violent crime is actually decreasing by impressive leaps and bounds in America. Mikhail Bakhtin - State Publishing House. Five years later, his first major work “Problems of Dostoevsky's Art” was published, in which he introduced dialogism. Beloved Characters - Character Sketch of The Brothers Karamazov research papers analyze each character in Dostoevsky's classic novel. English Language Imperialism in the Islamic World - Imperialism research papers point to the Victorian Era, Karl Marx and even Dostoevsky as sources of imperialism and fostering imperialistic thinking. Existentialism - Existentialism research papers discuss the existential movement that influenced much of the world in the 20th Century. Gothic Literature - Gothic literature became especially popular in the early 19th century, beginning with the 1818 publication of Mary Shelley's Frankenstein. Paper Masters writes custom research papers on Symbolism in Crime and Punishment by Fyodor Dostoevsky.